Dear Readers, we are presenting Daily Current Affairs for Govt Jobs- 7th December 2017. 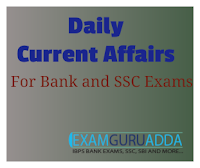 Daily Current Affairs and General Knowledge is very helpful for IBPS Bank Exams, SBI , RBI Assistant,NIACL, SSC and Railway Exams and other Govt Job aspirants. Vijay Kumar, a former chief business officer at NCDEX become MD and CEO of the country’s largest agri-futures bourse. India's Kumbh Mela has been recognised by UNESCO as an "intangible cultural heritage of humanity. The Intergovernmental Committee for the Safeguarding of Intangible Cultural Heritage under the UN body inscribed Kumbh Mela on the "Representative List of the Intangible Cultural Heritage of Humanity" at its 12th session in Jeju, South Korea. The International Solar Alliance (ISA) became treaty-based international intergovernmental organization on 6th December 2017 one month after Guinea became 15th country to ratify it. The Surface to Air Missile (SAM) AKASH was successfully tested with indigenous radio frequency seeker against target UAV Banshee. Prime Minister Narendra Modi inaugurated the BR Ambedkar International Centre in New Delhi. The prime minister also unveiled two statues of the Dalit icon at the center in Janpath. India has won the first-ever South Asian Regional Badminton Team Championship. In the title clash played in Guwahati, India defeated Nepal, 3-0. In the boys’ singles competition Aryaman Tandon defeated Dipesh Dhami while Ashmita Chaliha defeated Rashila Maharjan in the Girls’ singles event.